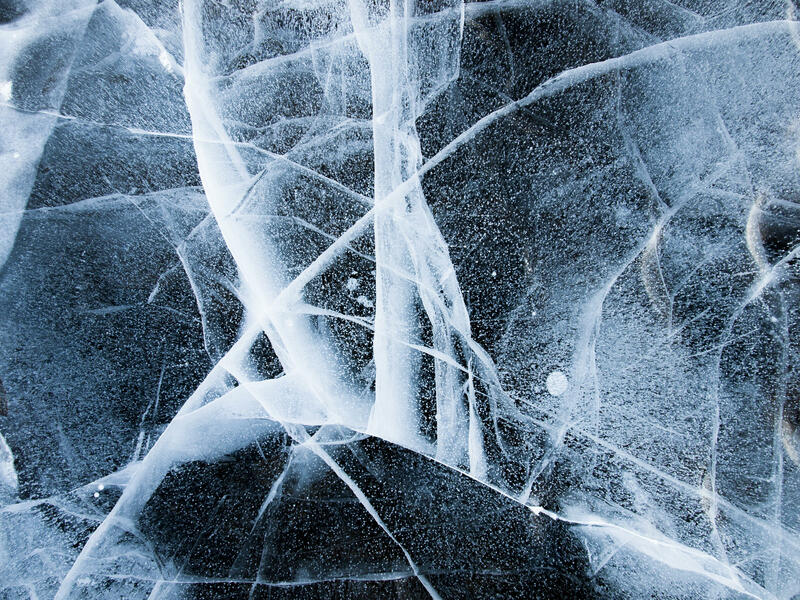 Ask Sam: Why is Some Ice Black And Some Ice White? If you don’t overthink it, and answer exactly as if you were a middle schooler contemplating which crayon to grab in order to draw the ocean, you should answer that water is blue. This is not a trick question; that is the right answer. When light enters water, the molecules absorb more of the light that’s on the red or yellow end of the spectrum — the longer wavelengths — and reflect back the blue ones — the shorter waves. Water looks clear in a glass because there’s just not enough of it. Think of a cup of tea on the counter: you look inside and it looks like tea, but if you spill a tiny bit on the counter it looks clear. The molecules in liquid water are not dense enough to reflect back enough blue for our eyes to perceive its blueness until it is rather deep. This is why shallow water can look transparent, but as it gets deeper that same water starts to look more and more blue. Similarly, in its purest form ice is also blue. If you need proof of this, just do a google image search for glacier ice. Glacier ice starts as snow, and then becomes more and more compacted by the weight of new snow on top of it. The pressure forces out impurities until eventually it’s just very dense crystals of mostly water, and in this form you’re really able to see the water’s elemental (errr… molecular?) blueness. When the conditions are just right, like they were on Lake Michigan in 2016, that same thing can happen to lake ice as well. OK, so if the real color of water is blue, why does ice look white and or even black? “People kind of can break things down into black ice and sometimes they can say white ice, and really it’s neither of those colors,” explains Lauren Farnsworth, a research scientist with the Army Corps of Engineers Cold Regions Research Lab in Hanover. As ice forms, it shapes up into crystals, and if it’s windy or anything else that causes turbulence in the water like a stream flowing in, the turbulence interrupts the growth of those crystals. In other words, turbulent water equals more, smaller ice crystals, instead of fewer, bigger ice crystals. “Basically if you have smaller crystals, you’re going to reflect light more easily and more often,” explains Farnsworth. To make this simple, “white ice” is ice with many crystals formed at odd-angles to each other, and the white is the glint of light being reflected back to your eye. “Black ice” is ice with fewer, large crystals formed all in alignment, so that the ice is transparent, but looks black because you’re able to see the lake beneath it, which between the water and the lake bottom absorb all the light and reflect very little back. So, what color is ice? Well, what is color anyway? Given that our eyes are weak, and easily tricked, maybe the best thing to do is to not dwell too long on that question, and just enjoy the skating while it’s good! Sam Evans-Brown, is host of NHPR’s Outside/In which you can subscribe to where-ever you get your podcasts. If you’d like to submit a question you can record it as a voice memo on your smartphone and send it to oustidein@nhpr.org, OR call the hotline, 1-844-GO-OTTER. Ask Sam: Why Can I See My Breath When A Car Drives By On A Cold Day? Every other Friday on Morning Edition, NHPR’s Sam Evans-Brown tracks down answers to questions about the environment and outdoors for our listeners in a segment we call Ask Sam. Ask Sam: Where Do These Subterranean Ice Spikes Come From? Matt from Concord asks: We were out hiking the other day and we saw these ice crystals coming up out of the ground and pushing moss up off the ground. They look like these long thin needle-like things. What causes that? Thank you! Ask Sam: Were The White Mountains Once As Tall As The Himalayas? David from Denver, Colorado asks: I studied geology ... and we learned extensively about the long and complex geological of the New England region. And I can’t help but wonder what was the maximum elevation achieved in New Hampshire and New England generally? Are you ready? Time to get your plate tectonics hat on! Ask Sam: Why Won't New Hampshire Admit There Are Mountain Lions Here? Ask Sam: Why Are So Many Mice Invading My Basement? Pam asks: Thank you for your article about the swimming squirrels. It made me wonder about all of the mice that are coming into our house and our rental, and wondered if you can explain why so many of our friends are finding mice already coming into their homes. This might seem like a simple question to answer, but there are layers here, people!